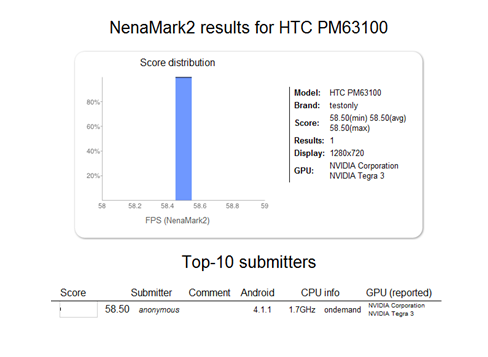 Oh hai there NenaMark2 benchmark with the HTC One X+, better known as the PM63100. Still curious about the differences between the One X and One X+? Good, because the the NenaMark2 benchmark shows the differences between the current model HTC One X and One X+ will live in the 1.7GHz processor and Android 4.1.1 software. The handset is currently running under the codename HTC Evitaire and is said to be on its way to AT&T, according to the folks at LandofDroid. Take heed T-Mobile fans, we’ve still got plenty of info that says this one will making its own appearance on Magenta store shelves in late September. According to our sources, T-Mobile’s internal codename remains HTC Era 42 and we’re very hopeful that September date doesn’t change because this will easily be one device we’re eager to get our hands on. That’s HTC for you. I’ve had several HTC phones and my experience with them has been mostly positive. However, they really need to end the practice of releasing a phone and following it up with a slightly updated version a few months later. Consumers will eventually figure out the pattern and hold off on buying newly released HTC phones, knowing that a better version will be out in a couple of months. No wonder their profits are dropping. Never again Samsung… I mean HTC… no, Samsung… no, HTC. Don’t they all do incremental updates on purpose? I remember the original Galaxy hellfire all too well when they followed it a few months later with an incremental upgrade. Different phones for different markets. Besides Samsung has been doing the exact same thing you just said and I don’t hear people calling them out on that. They have really diluted the Galaxy name by releasing Galaxy Blazes, Y, Ace, Duos, and more. Just count the total phones released by them and see. Plus HTC has updated most of their phones with few exceptions. Samsung won’t update phones quickly unless it’s a Note, SII, or SIII. You should hold Samsung and everyone else just as accountable for what you’re calling HTC out for.. I think that the only reason Jms122589 called out HTC was that HTC made a statement on focusing on quality rather than quantity meaning that they were going to reduce the number of devices that they release in 2012. Since Samsung made no such statement that I’m aware of, I wouldn’t call them out for releasing however many phones they release this year. Even before their official statement was released, many people griped HTC on the same principle on major forums and tech websites such as Phone Arena, Engadget, Pocket Now, and more. When Samsung does it, people seem to give them a free pass. I don’t hate Samsung by any means (they make good phones) but people should try and see the overall picture and not just hone in on one particular item. That still doesn’t change that HTC has made a statement now, but seems to be contradicting it. Don’t get me wrong. In my opinion, HTC has not come out with too many devices this year and quality has improved over last year. Samsung continues to release devices faster than I can keep up with, but the quality seems to be fine. The crux of my argument is that sometimes OEMs must make adjustments based on the conditions of the phone market. There could be a shortage of chips such as the S4 (so they substitute an S3 for the One S in India), unsupported LTE tech on the SoC (hence a One XL with the S4 on AT&T), carrier restrictions such as AT&T’s or Tmo’s exclusivity periods, or branding requests such as an EVO 4G LTE or a Droid Incredible. It would be nice if HTC could adopt Samsung’s strategy of releasing their lineup on all carriers but there are many other external factors that come into play and influence their own strategy so they must adjust. I have the Htc amaze and it will be the last htc phone I will buy.. Yeah they have pretty good build quality but fail to fix old issues. Such as light bleed from soft keys which shows on the screen. This was a problem they carried on to the htc one x. Lack of dev support was another when they claim to be dev friendly…. wouldn’t release the full source for wifi drivers and dont even get me started on battery life. Htc has been going down for a while now. I don’t see it changing unless they do some dramatic changes. Jumping ship to Samsung and it feels good! No more locked phones! I agree with you. I wanted the Blaze because of the smaller size but I didn’t get it because it is a pretty good assumption that support will be shortlived. Only the tech nerds and power users will be unhappy… and those people shouldn’t be using the blaze anyways. I mean support for bugs, not upgrades. Totally different. But for the Blaze, I doubt they will even fix bugs. It’s the same market. It’s neat this is coming to TMO (as well as AT&T); but if I were an AT&T person who recently bought a One X, I’d be pissed. Releasing a “upgraded” version of the same device, 6 months after the original comes out, is an uncool move… whether it’s HTC, Samsung, or Motorola who’s doing it (and they all do). I understand why they do it, but it must leave a bad taste in a lot of customers’ mouths. If it is LTE capable then i will upgrade. If not then i will sit on the fence. But then again HSPA+42 and the refarmed network should be very satisfying…. Tmobile’s HSPA+ network is plenty fast so long as its available in your area. I would say the best thing about it is the fact that the battery life should be better than an LTE network. So while HSPA+ may not be the fastest choice once their LTE network launches it will still be fast and give you improved battery life which would be the overall best choice for someone who wants both. I could’ve sworn that when Conan did an editorial a few weeks ago, he stated that only the Snapdragon line and Sony Ericsson were certified for Tmo’s HPSA+42 network. He stated, ” As of right now, only Qualcomm’s modem is certified for DC-HSPA (HSPA+42) on the T-Mobile network. Perhaps next year, ST-Ericsson’s Thor M7300 and M7400 modems will be validated for use on T-Mobile’s HSPA+42 and upcoming LTE networks.” The only modem from Nvidia that supports HSPA+42 is the Icera 410 but I can only find certifications for AT&T’s network. Will all LTE phones work on Tmobile’s LTE once TMo rolls it out? I’m considering purchasing the International version of the Galaxy Note 2 when I’m in Hong Kong in October (assuming it is released and I can find it there). I’m hoping it will work on TMobile. I imagine it won’t work on their current 4G service. So the best I can get without wifi will be 3.5G on Tmobile? Thanks for the info….appreciate it. Don’t forget TMOs 4g network is the “3.5G”. So it might not be LTE but that doesn’t mean it won’t be a fast connection on the Hspa+ network. Thanks. If it’s as fast as my Galaxy Nexus currently, then I’ll be a happy (and broke) man. Please, oh please have a microSD slot! I would much rather give my money to HTC than to the Samsung juggernaut (although I will be forced to get the SGSIII if this doesn’t have an SD slot). I can see why you’d want an SD card slot. I gave in myself and got the Samsung Galaxy S3 (from the HTC Amaze) and I must say I am very impressed. The last four phones that I had were all HTC and while I still like them I feel Samsung has come a long way. Personally I can’t live with a phone that doesn’t have a removable battery or sd card slot. Honestly though, you should give Samsung a chance. I think I do like Sense better than touchwiz just because it doesn’t seem as polished like Sense. However, touchwiz looks more like stock Android and isn’t as bloated, which is probably better if you want speed and a smoother experience in the long run. Yea i too am a big HTC fan. Love the quality of the software and hardware. I opened a new line and got the gs3. I agree that Samsung came a long way but touchwiz is boring. I truly expected something better from the S3. I still think its a cheap device. But certain devices arent for certain people. In my case Samsung isn’t t for me. I agree. I went from a HTC Amaze to the Galaxy S3 and the difference is quite apparent. I feel that while sense may be heavier/laggier/etc, it has some personality, and has more actual useable functions and is very refined. TW on the other hand, is faster, but feels like i’m using some childs toy. It definitely lacks personality, is unrefined, unpolished. Feels like a WIP (work in progress) to me. What are the advantages you see in Sense, in terms of usability? How about a One S+ in black with a higher resolution screen? Is this coming with HTC Sense? I want to see a head to head with galaxy s3. I’m still loving my sensation but I would be curious. I’m in contract for a year and half still. I can’t bring my self to pay full price yet. But who knows…. would be a world beater with: 1. stock android. 2. microSD slot. 3. removable battery. C’MON T-MO and HTC, do this! A few glaring ommissions from recent phones are responsible for where HTC is now. What they did right? Made the one series, with 3 levels of size/performance. branding was supposed to accomplish. phones at full retail from (for example) their website. including beats earphones with the phones that come with beats audio..
Anyways, if HTC fixes at least some of those, they should be fine. Also, after owning the Samsung Galaxy S3 and HTC Amaze, and using the Galaxy S2 and HTC One X, I definitely prefer the look, feel, and solid build quality of HTC. Both galaxies i’ve used felt extremely cheap and flimsy (esp the plastics all around). HTC still owns in that area imo. +1, I love the Galaxy line, but HTC’s give you a nice premium feeling that Samsungs don’t. Samsung is simply this… Make it flashy and pretty. It’s my opinion that sammy copied not only apple but I feel they ripped htc off on something’s too. There seems to be less heart and soul in Samsung products. Maybe they want it that way but aside from Apple, my favorite hardware company had and always will be HTC with Nokia rounding third. Well, while I’m not personally a fan of the iphone’s form factor for a few reasons, I can’t deny that it’s of high quality. Iphone’s feel a bit chunky in my hand for such a small device, but I did really like the 3gs model. HTC however does a very nice job with “most” of their phones. I definitely prefer their build over any other Android manufacturer on the market. I also agree that Samsung coming into the mobile game behind HTC & Apple definitely took alot of notes on why these two were so successful. There wasn’t much point in market research, it was pretty obvious that what HTC and Apple were producing was indefinitely what consumers wanted. I didn’t care for Samsung mobiles for quite a while, but they sort of grew on me. I think that they’ve done a good job of distinguishing themselves from the others in the past 18 months or so, & they’ve really started to make their phones their own & go in their own direction. And though alot of ppl say that Samsung has terrible build quality, I appreciate some aspects of their design. They’re very light weight, they are as you say flashy & pretty, and they’ve managed to become almost as identifiable as an Apple iphone because of their unique look that they’ve adapted. Removable battery & on board micro sd slots are a big plus for my style of usage. All three manufacturers have their different strengths in my opinion, and while I’ve never owned a Nokia smartphone, I like them very much. Nokias are and always have been very solid built, and the only reason I don’t own one at the moment is because I’m waiting for their first Windows 8 phone! I hit the nail on the head when I predicted that the Lumia series wouldn’t be seeing the upgrade. The Metro UI is gorgeous and I hope it really hits its full potential. With a company like Nokias producing your hardware, you don’t have to worry about whether or not it will be attractive to consumers. In fact I can’t think of anyone on any of the many forums I frequent that has ever complained about Nokias build quality! I heard one YouTube review that said how much he loved the Lumia 900’s form factor, but that it continuously gave him painful blisters, lol. What a sissy, huh! If Tmo pass this up this year; am gonna cancel my service, pay the ETF fee, and go to ATT. Am getting a little fed up with the lack of premium devices on this network. leave outdated devices, enter overpriced service! You mean premium devices like the SGS3? Yeah, TMo does’t have any premium devices. If, like me, you happen to intensely dislike samsung then that remains a problem. I have been samsunged three times with buggy software implementation and poorly updated stability fixes that remained buggy. I had the displeasure of owning a vibrant with the gps that never worked right and they could never fix. And the promise to update the lag ridden Behold II that they lied on and never came. Or the sidekick 4g that crashed, locked and had to have battery pulls three times a day. I gave up on T-Mo getting phones that I wanted and just bought unlocked phones that I could use. Right now I am very happy with the pureview 808 I got on amazon and will probably use this for some time. The camera on this thing is insane. Your outlook on Samsung… should have changed with the Galaxy Nexus and with Samsung’s new consistency shown now with the GS3. Believe me, I had been a complete HTC guy. Samsung, as everyone knows is the new Apple Killer. My apple fan boyish not withstanding but even if they’ve been dethroned you likely won’t ever see them get “killed”. They have an interesting way of always selling well and being very profitable. It’s just how it is. Apple doesn’t have to be #1 to be successful and have significant influence over the tech world. Oh Richard, Richard, Richard, you’re SO UNBELIEVABLY BIASED against Apple, it’s impossible to take you seriously. Lol did apple ever do something to you personally?? Yes, they did, he’s one of the worst trolls around. What is that old saying…. fool me once, shame on you… fool me three times?…. No thanks to samsung. Never again. I had a Nexus One that I loved and wanted to get a new nexus but no thanks because it was samsung. The rumor that there will be five nexus phones being released soon by different manufacturers brings some hope to me of getting a nexus again. In the mean time, I am loving this Nokia Pureview 808, the phone reception is better than anything I have ever owned, and the camera is so good it’s like having a dslr you can carry in your pocket. I did that and had soooooooooo many dropped calls. I came running back to T-Mo. Trust me AT&T is no good and they are a lot more expensive. The way T-Mobile has been pricing things lately, this will probably be $299 after rebate with a contract. AT&T’s subsidized prices have shocked me as of late with how cheap some of these phones are. I mean… Holy crap 99 for the one x and gs3 here in Boston. I was floored! Makes me appreciate the stuff competition in the smartphone market. But you do realize that you’re paying more… Ah nevermind. I’m well aware. I need it for work and i do travel a lot outside major metropolitan areas and unfortunately tmo doesn’t have that broad reaching where I need it. The cost satisfies the personal value and need. I’m thinking we may see a quad core in the new nexus also. Keep in mind the Nexus will probably be pentaband hspa 21, which I think a Tegra 3 will operate on the network? So, you may still want to hold out. I’m sure we will know some more about the Nexus by the time this is released. Educated guess based on history: This phone will be released be 7-14 days before the iphone is released to try to stop people from leaving. Educated guess based on history: It won’t work. The Current Tmo Samsung GS3 is better than the iphone 5 .. why leave??? Exactly, If your on Tmobile at this time…NOBODY is leaving for any of the other carriers. Tmobile is rocking at this time with the GALAXY S2, GALAXY NOTE, GALAXY S3 and the GALAXY NEXUS. Plus they will be getting the GALAXY NOTE 2 before November 2012 so if your on Tmobile you are just fine in my book. If this hits Tmo, I will have it for sure! The first quad core, maybe on any us carrier, right here on our beloved Tmo? Oh, I’m loving this! I know Att does exclusive deals, but I really hope Tmo doesn’t go this route. I like seeing devices on every carrier, as it helps those of us that enjoy flashing roms because we generally see more development, & its nice to see everyone have the device available as an option. I’d like to see Tmo be the first, but I hope it hits all carriers! My guess is that itll be treated like the one x and one s. AT&T always seems to lock in the phones with nicer features but I’m sure what ever these guys get won’t be anything to scoff at. I’m just happy that smartphones are finally at tr quad core level. I would sell my galaxy nexus right now if I could get this in a windows phone 8 flavor with 4.7″ LCD 2 screen. I’m praying AT&T gets the htc zenith and that it’s not a battery draining power whore. The outlook love it would give me would make it a perfect work phone. I prefer HTC’s hardware build over the cheap plastic feeling of the Samsung phones. Their only problem is the battery life. Just about every HTC Android that I’ve owned has had subpar battery life. Improve in that area and HTC would have the ideal device. The new One series has awesome battery life. Part of it was programming which is updated, part of it is the new LED (instead of LCD) screens. My old amaze worked about 11 hours a day. My One S lasts from 0900-2300 and still has 20% power…and I’m a constant user. Great specs I must say. I give HTC credit if they can make this work and launch it on tmobile without flaws. Otherwise it’s either the GALAXY NOTE 2 or the NEXT NEXUS on tmobile for me. My current GALAXY S3 let’s me know that from a software standpoint NO OTHER MANUFACTURER can touch SAMSUNG. Htc has plenty of glitches and software bugs that I am veru fimilar with since my EVO 4G and EVO 3D. So I like rolling with SAMSUNG/TMOBILE the perfect combination…. Haven’t seen you in a LONG time. You aren’t the same troll that you used to be are you? And what ever happened to your undying love for HTC? With that asked, SAMSUNG/TMOBILE is definitely the perfect combination!! The One X case is already awesome. Cramming this into it will make it the best phone on the market.